Calling prospective customers using a lead-generating company generally results in a 1 percent to 2 percent success rate. But advance research and information from various sources can dramatically increase your success rate. Quoted in Inc. magazine, salesman David Rosen (the happiest cold caller you’ll ever meet, they say) finds clients by using creative online searches. Rosen is a seller of limited-batch wines for various wine makers, mostly in California. He also checks the letters to the editor in wine magazines, scrolls through wine blogs, and Googles word combinations like “wine club” in various cities. 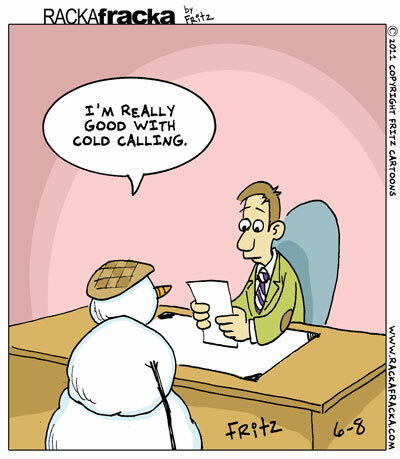 When he has identified a lead, he checks the Internet for potentially helpful information about the person, insights, he says, that help him take the chill out of cold call. Tracking an individual to his or her office supplies a job title, office phone number and often a photo that suggests the person’s age. He tells the story of finding a man’s name in a newspaper article that showed a photo of the wine room in his home. He called the phone number and must have charmed the man’s wife because she told him where he worked and gave his office phone number. The man was CEO of the company and enjoyed his conversations with Rosen. To date, he has placed 33 orders with him.